Mediomics, LLC is pleased to announce certification of their Quality Management System to the ISO 9001:2015 standard, effective September 1st 2018. Mediomics had previously earned certification under the ISO 9001:2008 standard on September 1st 2015 and was audited annually to ensure conformance to the standard. Mediomics’ primary goal is to meet the needs of their customers within the research field by producing a range of high quality assay kits used to detect various biological and therapeutic macromolecules. The ISO 9001:2015 standard helps them stay true to this goal. 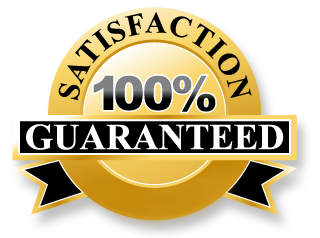 This is done by ensuring that their Quality Management System details the customers’ needs and requirements and critically evaluates any relevant risks or opportunities that may affect those needs. Certification to the ISO 9001:2015 standard is a reflection of Mediomics’ dedication to continual improvement, strong customer service, and the manufacturing of quality products. Mediomics looks forward to continuing to serve the needs of the larger scientific community. Congratulations to our clients on their recent publications! Dr. Chen-Kang Chang and team studied the effects of branched-chain amino acids (BCAA), arginine, and citrulline supplementation on central fatigue. Between periods of intensive Taekwando exercise, they measured the premotor reaction time of athletes who were given amino acid (AA) supplements versus those who received a placebo. They also measured the ratios of free tryptophan to BCAA, since tryptophan is a precursor to serotonin– a molecule that may be responsible for lethargy when present in high levels. This paper was published in the Journal of the International Society of Sports Nutrition. To see how AA supplementation affected central fatigue, click here to read about it! Dr. Chang and team also studied the effects of AA supplementation on tennis players’ perceptual motor performance. They provided the subjects with either the AA supplements or a placebo one hour before starting tennis matches. They measured the accuracy and consistency that the players hit the tennis balls with, along with the players’ tryptophan levels. This second paper was published in the Scandinavian Journal of Medicine & Science in Sports. Click here to see how AA supplementation affected tennis players’ perceptual motor performance! Mediomics Bridge-It Tryptophan Assay Kit was used in the study to measure the concentration of plasma free tryptophan. Mediomics is proud to serve such innovative clients and wishes them the best of luck in their future projects! Congratulations to our clients on their December publication in BMC Systems Biology! Dr. Matias Zurbriggen and team set out to create a system that models the detection of the border between two distinct cell populations. They designed a network where L-Tryptophan diffuses across the border from its sender/receiver cell population to the adjacent population. In turn, a second signaling protein, Interleukin-4 (Il-4), is released in a dose-dependent manner. Once Il-4 travels back to the sender/receiver cell, it activates expression of a fluorescent reporter protein at the border between the two populations. They measured the fluorescence at the border, in response to increased levels of Tryptophan/Il-4. Research like this has serious implications in the field of tissue engineering. Mediomics Bridge-It Tryptophan Assay Kit was used in the study to measure the concentration of Tryptophan. To see more details about how their system worked, check out the full article here. 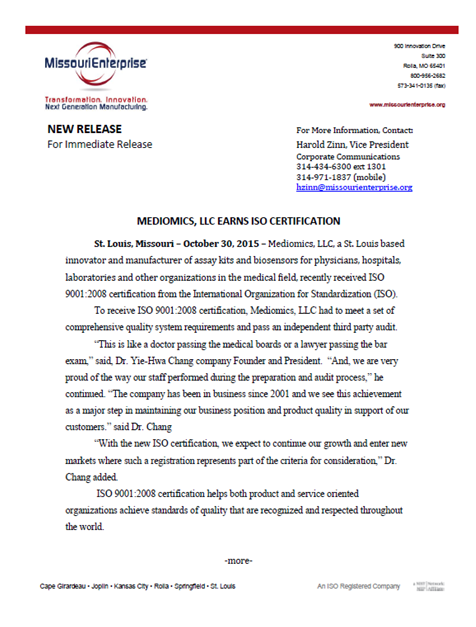 St. Louis, Missouri – October 30, 2015 – Mediomics, LLC, a St. Louis based innovator and manufacturer of assay kits and biosensors for physicians, hospitals, laboratories and other organizations in the medical field, recently received ISO 9001:2008 certification from the International Organization for Standardization (ISO). To receive ISO 9001:2008 certification, Mediomics, LLC had to meet a set of comprehensive quality system requirements and pass an independent third party audit. “With the new ISO certification, we expect to continue our growth and enter new markets where such a registration represents part of the criteria for consideration,” Dr. Chang added. ISO 9001:2008 certification helps both product and service oriented organizations achieve standards of quality that are recognized and respected throughout the world. Mediomics LLC’s patented technology provides the quick detection of biomolecules, which will revolutionize the ability of medical facilities and physician’s offices to do onsite testing for their patients faster and more cost effectively. These quick and simple test kits are used to quantify many biologically and therapeutically important macromolecules, including DNA, biomarkers, hormones, antibodies, intracellular signaling molecules, protein-protein complexes, bacteria, fungi and viruses. In simplest terms, Mediomics’ technologies can do a wide variety of common medical tests faster and cheaper than conventional testing methods. To date, Mediomics, LLC has received $5.6 million in highly competitive SBIR/STTR Phase I/II grants from the National Science Foundation, the National Institutes of Health and the Department of Defense. The company is located in a 4,500 SQ’ facility equipped with state-of-the-art research and production equipment. During the certification process, Missouri Enterprise ISO experts provided Mediomics, LLC, with training, documentation preparation and implementation assistance, auditing support and on-site support. Congratulations to our clients for their publication in the FASEB Journal! The role of Pannexin 3 in bone development has not yet been studied in vivo. Dr. Lee and team’s recent research provides evidence of the crucial roles of Panx3 in vertebrate skeletal development in vivo. Mediomics’ Bridge-It cAMP designer Assay kit was used to measure cAMP levels in cells. To find out more about Dr. Lee’s research, access the link here. Mediomics is proud to serve such innovative clients in research and wishes them the best of luck in their future projects! Mediomics is proud to present our very first video tutorial! This two and a half minute clip demonstrates how to make a standard curve using Mediomics Bridge-It® Assay Kits. The instructions in the video are taken directly from the Bridge-It® L-Tryptophan Fluorescence Assay 96-well protocol, but the idea can be applied to all of our 96-well Bridge-It® Kits. Click the link at the top to view the video on YouTube. Enjoy! Featured Publication: Pfizer Oncology Team identifies potential therapeutic targets for lung cancer published in the EMBO Journal in May, 2015. Mediomics wishes to congratulate Dr. Stephen Dann and his team for their important discovery of the reciprocal regulation between extracellular Met uptake and epigenetic state in malignant cells. They identified Lat1, an amino acid transporter, as a downstream biomarker of EZH2 activity and demonstrated the critical role of Lat1 in supporting tumor growth. Mediomics is proud to serve such innovative clients in cancer research and wishes them the best of luck in their future projects! To read more about Dr. Dann’s research, access the link here. Congratulations to our clients in Japan on their February publication in Nature Medicine! Dr. Keizo Nishikawa and team identified various metabolic processes involved in osteoclastogenesis, including the increased production of SAM. The research provides knowledge towards developing new therapeutic strategies for a variety of bone disorders. Mediomics’ Bridge-It S-adenosyl Methionine Assay Kit was used in the study to detect SAM in osteoclast precursors and osteoclasts. To read more about Dr. Nishikawa’s research, access the link here. Congratulations to our clients on their March publication in PLOS One! Dr. Chen-Kang Chang and team studied the effects of branched chain amino acid and arginine supplementation on physical and mental fatigue. They measured how the performance of the sprint activity after 2 consecutive days differed between players given the amino acid supplementation versus those who received the placebo. To see how the supplementation affected overall performance, check out the full article here. Mediomics, LLC has been awarded a $969,770 Phase II SBIR contract (HHSN261201300047C) from the National Cancer Institute, National Institutes of Health, Department of Health and Human Services. After successful completion of Phase I research, this project aims to develop a panel of high affinity scFvs for the detection of O-GlcNAc modified proteins. Using Mediomics’ innovative molecular PINCER® platform, Mediomics will develop the most effective methods to quickly screen for high affinity monoclonal antibodies to detect important post-translation modifications of proteins. Mediomics provides innovative assay kits, biosensors, and multiplexed assays for academic and corporate research, point of care testing, food and pharmaceutical production process control, as well as the medical and environmental research markets. These assay kits will be used to quantify most biologically and therapeutically important macromolecules, including ligands, proteins, protein complexes, and pathogens, including bacteria, fungi, and viruses. The in vitro diagnostics market is expected to reach $74.46 billion by 2020, which demonstrates a steady growth from an anticipated value of $69.1 billion in 2017 and its estimated value of $51 billion in 2010. The company’s rapid, mix-and–measure homogeneous assays have already been adapted for the detection of a range of biologically and therapeutically important macromolecules, including cAMP, tryptophan, S-adenosyl methionine, L-Methionine, PDE, biotin, human insulin, human albumin, human C-reactive protein (hCRP), IgG, IgM, E. coli, and others. In addition, Mediomics has also received an SBIR Phase II contract (200-2012-52857) from the CDC to develop robust and cost-effective homogeneous assays for quick detection of HCV infection, and an SBIR Phase II contract (HHSN261201200081C) from National Cancer Institute to develop a fully automated in-process bioanalyzer to detect the titer of protein drugs during their production. Mediomics is a St. Louis based Biotech company. The Company is commercializing core technologies for which it has secured an exclusive license from Saint Louis University, including the following: (i) a DNA-binding protein-based bioassay, biosensor, multiplexed platform, (ii) a related variant – the molecular PINCER®-based homogeneous biosensor, bioassay, multiplexed assay platforms and companion devices, and (iii) innovative, proprietary methods to screen and develop new high-affinity capture reagents for research, diagnostic, and therapeutic use.